This IBM® Redbooks® publication describes how to exchange data between applications running in two separate enterprises reliably and securely. This book includes an overview of the concepts of managed file transfer, the technologies that can be used, and common topologies for file transfer solutions. It then provides four scenarios that address different requirements. These scenarios provide a range of options that can be suited to your individual needs. This book is intended for anyone who needs to design or develop a file transfer solution for his enterprise. The first scenario shows the use of an HTTPS web gateway to allow files to be transferred from an external web client to an internal WebSphere MQ File Transfer Edition backbone network. 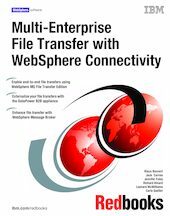 This option uses the WebSphere MQ File Transfer Edition Web Gateway SupportPac FO02. The third scenario extends the concept of file transfer between enterprises by introducing more sophisticated transfer capabilities, along with enhanced security. This scenario uses the IBM WebSphere DataPower B2B Appliance XB60 to look at the specific case of file transfers between business partners. The last scenario also illustrates the integration of the IBM WebSphere DataPower B2B Appliance XB60 and WebSphere MQ File Transfer Edition, but in this case, non-business-to-business protocols are used. The file transfer is further enhanced through the use of WebSphere® Message Broker to mediate the file transfer for routing and protocol transformation within the enterprise.